Elizabeth Gaskell did not have the happiest start in life. Barely a month after her birth in 1810, her mother died and her father, unable to cope, sent her to be raised by his sister-in-law in Knutsford. It was a long way from her native London. Even by mail coach, then the fastest form of transport, the journey would have taken more than a day. But there the young Elizabeth was to find the contentment of which she had been robbed. It was a fairy-tale place. Nestled in the Cheshire Plain, some nine miles north-west of Macclesfield, Knutsford was – and remains – a little village, surrounded on all sides by rolling fields. Life there was simple. Farm workers, craftsmen and shopkeepers still followed the customs of their fathers and folk traditions structured the year. Instead of frumenty [a sort of sweet porridge], we eat Simnel cake: a cake made variously, but always with saffron for its principal ingredient. This I should fancy was a relic of Papistry, but I wonder how it originated. Lambert Simnel, the imposter in Henry the Seventh’s time was a baker’s son, I think. The show windows are filled with them, [and] high and low eat them. Since Gaskell’s day, simnel cake has changed a great deal. Now eaten at Easter, rather than in the middle of Lent, it tastes – and looks – quite different from how it did in the early 19th century. Although it is still a light, rich fruit cake, packed with raisins, sultanas and lemon zest, saffron is now rarely used. Two layers of marzipan or almond paste – unknown to the Georgian recipe – are also added, one in the middle and one on top; and 11 marzipan balls – said to represent the 11 faithful apostles – are generally used for decoration. The method is different, too. Whereas it was once boiled, then baked, it is today baked and then grilled. But its origins are still tricky to pin down. The word simnel comes from the Latin simila, meaning a finely ground wheaten flour. As such, when it first appears in English sources it is used either with this sense or to refer to a special type of bread. According to an entry in the Winchester Annals for the year 1042, for example, Edward the Confessor ordered that, whenever he or his successors wore the crown at Winchester, Worcester, or Westminster, the local abbey should be given ‘one hundred simnels and a hogshead of wine’. Similarly, the Chronicle of Battle Abbey – which was completed in the early 12th century – records that, after founding the monastery, William the Conqueror left the monks ‘a memorial of his affection, in appointing for their daily use, bread fit for the royal table, which is commonly called simenel’. And in 1266-7, Henry III decreed that ‘bread made into a simnel’ was of such exceptional quality that it ‘should weigh two shillings less than ‘wastel’ bread’. At some point in the early 13th century, however, the word simnel was also used to describe a type of cake. In his Dictionarius (c.1225), John of Garland explained that simineus was the French word for the Latin placenta, a sort of cake which was displayed in shop windows to attract the attention of hungry students from the University of Paris. What it tasted like is unclear. Although a passage in Cato the Elder’s De agri cultura suggests that, in ancient Rome, placenta was made with semolina dough, cheese and honey, there is no way of telling whether it was made in the same way in medieval France. For some time, simnel remained an ambiguous word. In the 15th and 16th centuries, it continued to be used primarily to describe a type of flour – or occasionally as a metonym for baking generally. Lambert Simnel, the Tudor pretender who briefly threatened the rule of Henry VII in 1487, was, as Gaskell noted, probably the son of a baker who owed his name to the flour that was his father’s stock in trade. But at the same time, simnel could also be used to refer to any sort of bread or cake made with the flour. When Myles Coverdale produced his English translation of the Bible in 1535, he rendered Ezekiel 16:19 – which in the Vulgate reads Et panem meum quem dedi tibi, similam, et oleum, et mel (‘And my bread, which I gave to you, the flour and oil and honey’) – as: ‘Thou didst eate nothinge but symnels, honney and oyle’; but when Thomas Cogan’s The Hauen of Health (1584) was published five decades later, it included a reference to ‘Cakes of all forms, Simnels, Cracknels, Bunnes … and other things made of wheate flour’. By the time of James I, however, a series of radical changes had taken place. Simnel flour and simnel bread had both begun to recede from view and simnel cake had moved centre stage, beginning to assume a more definite form. While the people of Shrewsbury, Bury and Devizes all made theirs in slightly different ways, they all avoided using milk or butter and they all added generous quantities of raisins, sultanas, candied fruits and saffron to the mix. They all cooked their cakes in the same peculiar way, too. As Andrew Willet reported in the second edition of his Hexapla in Genesin & Edodum (1608), simnel cakes were boiled in a bag – like a Christmas pudding – and then baked. It was about this time that simnel cakes gained an association with Mothering Sunday, as well. Exactly when is unclear. The earliest certain reference appears in a 17th-century poem by Robert Herrick. Alluding to a practice he had observed in Gloucester, Herrick expressed his hope that, if he gave his beloved ‘Dianeme’ a simnel cake for her mother, she would share ‘half the blessing’ she received in return with him. But it seems likely that, by Herrick’s day, simnel cake had been the sine qua non of Mothering Sunday for some time. It is not hard to see where the connection came from. Although it was only in the decades after Henry VIII’s break with Rome that people adopted the practice of returning to their ‘mother’ church (where they had been baptised) and of bringing presents for their mothers, the fourth Sunday in Lent had long been a day of feasting, on which the traditional fast was suspended. Mothering Sunday was therefore bound up in the popular imagination with sweet and tasty foods, such as cakes. But therein lay a problem. Since butter and cream were forbidden during Lent and could not be kept for long, they were hard to come by, making it almost impossible to make any cake that required them. Simnel cake, by contrast, was ideally suited to the season. Other than eggs – which were always available – it did not require any dairy products; and its principal ingredients were all dried or preserved. That it was unleavened, to boot, only seemed to make it more apposite. That [it] should be [of] town and country the pride. And resolved to put on the pot and boil it. And place it within a hot oven and bake it. That the cake from that instant was called SIM-NELL. It was nonsense, of course; but such silly tales only added to the fun of the festival. 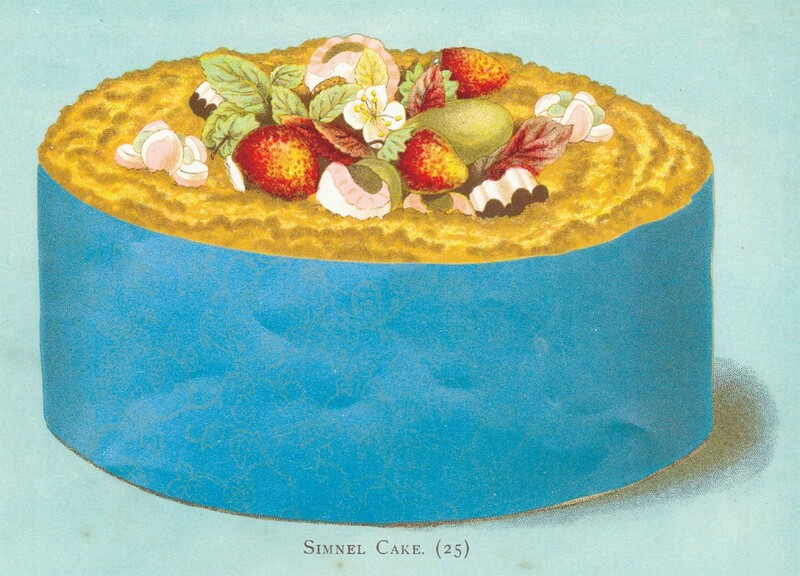 At some point towards the end of the 19th century, however, simnel cake stopped being a Mothering Sunday treat and started being eaten at Easter, too. Back in 1783, an article in the Gentleman’s Weekly had noted that it was eaten during Passion Week, alongside hot cross buns and saffron cakes. But the trend was accelerated by the late Victorian revival of Easter as a time of feasting and the corresponding decline of Mothering Sunday. Just as Easter bonnets and postcards came into vogue, so traditional foods were adapted to a fresh purpose and imbued with new meaning. Freed from its old moorings, simnel cake gradually became more widely known. From its old heartlands in the North and West of England, it spread throughout the country and, in doing so, it acquired a more uniform character. Shrewsbury simnel cake – distinguished by its thick marzipan crust – came to predominate, perhaps because it looked more like a typical cake than some other versions; the marzipan coating became thicker; and penny-pinching cooks increasingly replaced saffron with allspice. It was, admittedly, slow to catch on, especially in the South and East. According to Chambers Book of Days (1869), those who had not seen a simnel cake before were often baffled when they received one as a gift. One gentleman was reportedly so bemused by its thick crust that he gave orders for it to be softened in a pan of boiling water, while a lady mistook hers for a footstool! By the early 20th century, however, simnel cake had won over its doubters. With a much reduced marzipan covering and a lighter, more ‘cake-like’ consistency, it had become the Easter treat we know and love today. Of course, this is not the end of its journey. As attitudes towards Lent evolve and future generations develop traditions of their own, it will undergo many more transformations. But as you tuck into a slice this Easter, it is worth sparing a thought for how far the humble simnel cake has already come. Alexander Lee is a fellow in the Centre for the Study of the Renaissance at the University of Warwick. His latest book is Humanism and Empire: The Imperial Ideal in Fourteenth-Century Italy (Oxford, 2018).